Having a party, reception, or conference event? 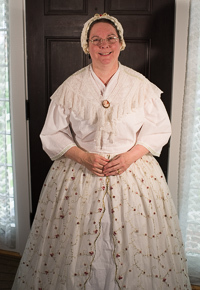 Diane will be happy to attend as an historical personage, in authentic clothing, and interact with your guests, telling them about her life and times. She can also come as an average person from a certain time period. And as Mrs. Santa Claus, she adds much merriment to holiday gatherings, recounting recent mischief-making by elves, reindeer, and her jolly old spouse. Fees are flexible, depending on travel and length of event. For more information or to invite any of these fascinating people to your event, please contact us.